We will contact all subscribers as soon as possible after the final issue has been delivered regarding a refund of your remaining subscription fee. If you pay by annual standing order, please cancel it immediately. If you currently pay by monthly standing order, please cancel this with your bank after the April payment. Our sincerest thanks to you all for your support over the years. Wow - what a nice review! Malmsteen! Whiskey! Cats In Space!! Well issue 228 is out now, containing my interview with New York blues/rock singer Sari Schorr, along with a review of her stonking new album. In the next issue, I have a long feature on Thunder front man and Planet Rock DJ Danny Bowes - plus Cornwall Band Wille and the Bandits. (That's 'Wille', not 'Willie' by the way.) Got some good gigs coming up too, both prog and hard rock! 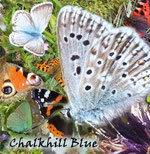 Chalkhill Blue's 'difficult' second album is panting on towards the finishing line! I managed to get a first draft down on to CD last month, and identified loads of potential improvements. These have all been made, and the remastering is now in progress! Only tons and tons of work still left to do, then it will be ready for publication! Yay!